Say hello to the new Kia Forte from Kendall Kia! This compact car is fun to drive and has the perfect combination of features to satisfy drivers of all ages. Available in the Kia Forte FE, Forte LXS, Forte S, and Forte EX trim levels, the Kia Forte is sleek on the outside and smart on the inside. You’ll love showing off your new Kia Forte on the streets from Nampa to Boise and beyond. From the signature Kia reverse-bowtie, blacked-out grille to the alloy all-season wheels to the generous cargo room and everything in between, the Kia Forte is truly a finely crafted car. Introduce yourself by browsing our available inventory of the new Kia Forte in Nampa. Don’t be shy—say hello to this driver-friendly car. You’ll be glad you did. Now that you have introduced yourself to the Kia Forte at Kendall Kia, be sure to call or contact us online if you have any questions. Our friendly and professional team is ready to help you through the car buying process. Our Kia Finance Center will help you find the right finance option to meet your lifestyle and budget. We’ll also take care of your current car by providing you with a fair trade-in value. It really is that simple! Say hello to the Kia Forte in person and take it out for a test drive today by visiting our Kia showroom. We are conveniently located at 15700 N. Idaho Center Blvd. Nampa, Idaho 83687, just a short drive from Boise, Eagle, and Kuna. 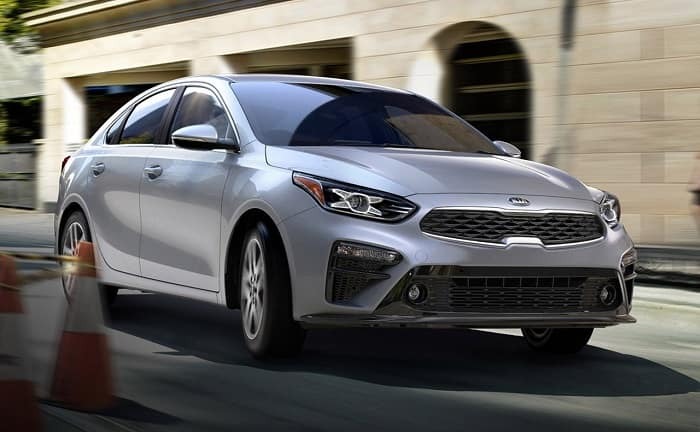 The Kia Forte comes with a 2.0L DOHC I-4 with six-speed manual transmission and optional electrically controlled six-speed automatic transmission with Sportmatic®. MacPherson Strut suspension in the front and twintube shock absorbers in the back will get you where you need to go so smoothly you’ll think you’re floating on clouds over Idaho’s roads. Some standard safety features include four-wheel anti-lock brakes, stability and traction control, hill-start assist, and downhill brake assist. Also, standard are dual front, side, and curtain airbags. Stay out of the cold with the Kia Forte’s remote keyless entry. Once inside, keep your eyes and hands on the road thanks to the audio and cruise controls mounted on the steering wheel at your fingertips. Bluetooth wireless data link provides a hands-free calling experience, allowing you to focus on the road ahead. For exceptional value and a fun driving experience every time you get behind the wheel, say hello to the new Kia Forte!